A castle was built by the Normans, in the C12th and around it grew a small town, which is known from documentary evidence to have thrived during the C12th to the C14th . During this time, being located on the border with the Welsh lordship of Afan, it suffered many attacks and the castle was partially destroyed and rebuilt on a number of occasions. From at least the middle of the C14th there was encroachment of sand and by the end of the 15th century the town and castle were abandoned. Since then, there has been virtually no disturbance to the landscape, with remains of the town buried beneath sand dunes at depths varying between a few centimetres and 30 metres. 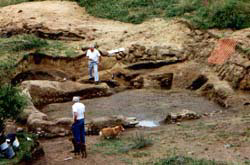 After the Society was formed in 1989, it became apparent that there was considerable interest in excavating the supposed area of the old town of Kenfig Eventually, the necessary permissions to excavate were obtained and a site was chosen, which was outside the scheduled area but still near to the remains of Kenfig Castle and which was also free of any large dunes and was not waterlogged. Work commenced early in 1993 and has continued intermittently each summer since then. 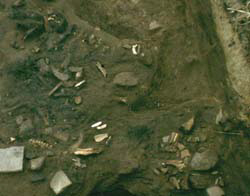 It was found that the sand usually covered a layer of darker material, which was rich in pottery, bones etc. Below this lies the hard stony clay, which forms the subsoil of the area. In some places this dark layer is absent and the sand lies directly on the subsoil, whilst in other parts, there is an additional layer of darker sand between the dark artefact-rich layer and the subsoil - see picture. The main discovery has been a building about 8m by 5m The base of the walls consists of about 3 courses of masonry lying in what appears to be a slight hollow in the subsoil. There are entrances in the middle of each of the long sides. Above the masonry, the walls are made of clay and in parts they still rise to a height of 3ft. No hearth was found inside the building and so we assume it was not a dwelling. Neither are there any post holes to support the roof. This roof would have been of thatch and would have been far too heavy for the clay walls to support. We therefore think that the roof would have been supported by timber crucks, which would have sprung from the flat stones, which we have found around the base of the building. This building technique is known as clom construction and this must be one of the oldest buildings of this type in existence, because normally the clay in the walls, which in our case was protected by sand, would have been washed away over the years. In the subsoil over most of the excavated area, a series of ridges have been found, running parallel to each other and remarkably evenly spaced at about 18 inches. The consensus of opinion is that these represent the remains of furrows made by medieval farmers ploughing the area. In one particular year, these ploughed fields would have been suddenly covered by sand and would have been abandoned. Perhaps later the sand would be blown away, taking much of the topsoil with it. This process may have been repeated several times over the years, until all that was left are these marks in the subsoil. The furrows appear to continue right up to the walls of the building and it is evident that its foundations were dug in this ploughed surface. The dark layer contains large amounts of small pieces of pottery, shells, bones etc. and it is evident that what we have found is a medieval rubbish dump where people threw their rubbish. This layer is not continuous over the whole site, but is most obvious in the vicinity of the building and indeed the layer abuts right up to outside of three of the walls. It seems unlikely that people would have dumped their rubbish all around the building if it was still being used, so we assume that it had fallen into ruin before the area started to be used as a dump. Scattered over the site we have found large quantities of iron slag, which clearly indicates that they were either smelting or smithing iron on the site. However, no sign has been found of a furnace or a hearth. The datable artefacts, which we have found, consist mainly of pieces of pottery and arrowheads, which can be dated to the 13th century. A silver long cross penny, which has been dated between 1280 and 1284 was also found, together with two quarter segments of pennies, dating between 1251 and 1272 and 1248 and 1250 respectively. So evidently the site was being used as a rubbish dump by about 1300 - 1320 say. Because the rubbish is right up against the walls of the building, we would assume that the building had been abandoned by that time. So we could assign a date of say 1280 - 1300 at the latest to the building. Now since the building seems to have been built on land that had once been ploughed, we can assume that the cultivation of this land had ceased some time prior to 1280. If the reason for abandoning the field was the influx of sand then we must assume that this process started about 1275. In places the rubbish layer was dumped onto sand and in others onto the clay subsoil. So it looks as if the advance of the sand was not a steady process but that after an initial burying by sand, resulting in the field being abandoned, the wind may well have blown away some of this sand together with the topsoil, laying bare the clay subsoil upon which people, who were still living nearby built the building, perhaps for the purpose of iron making. Further inroads by the sand eventually caused the abandonment and subsequent collapse of the building and the site became a rubbish dump for the people still living in nearby areas as yet free from sand. So this might be what happened in one small area lying just outside what was probably the extreme south-westerly edge of the old town of Kenfig. How typical it is of the history of the rest of the town we don't know. We have hardly pricked the surface in our 12 years of excavation but it seems it has sometimes brought us close to those people who lived there 700 years ago and given us at least some feel for what it must have been like to have your home and community and whole way of life destroyed by the inexorable power of the elements. The Royal Commission on Ancient Monuments in Wales - The Early Castles'. Section EM2 pp 314 -326. Richard, Arthur J., Kenfig Castle, Arch. Camb. 1925, pp 161-182. Frances, M. & Lewis, J.M. 1984, ' Pottery from Kenfig Castle', Medieval and Later Pottery in Wales 7, 1-8.